Spotted horses have been around for millenia. Archeologists have found numerous images of them depicted in prehistoric cave wall paintings throughout the ancient world. One such breed of spotted horse, the Appaloosa, has been capturing the hearts of horse lovers for centuries, with its delightful disposition, striking appearance, and adaptability to a wide range of uses and situations. Nevertheless, the breed has faced challenges to its very existence because of displacement and dispersion of the Native Americans who developed it. Breeders have fought to preserve the beloved breed, however, and the Appaloosa Horse Club—the international breed registry—was founded in 1938. Since then, the breed has become popular throughout North America and Europe. The Appaloosa breed was developed by the Nez Perce tribe of the northwest U.S., who observed strict breeding practices to create a horse that was colorful, tractable, and intelligent. The breed's name likely relates to the place where the Nez Perce was bred and treasured the unmistakable horses: the Palouse River area. The strikingly colored horses were referred to as the “Palouse River Horses," which eventually became "Appaloosas." The origins of the Nez Perces' breeding stock trace all the way back to Spanish horses introduced to the Americas in the 16th century. Unfortunately, the breed was almost lost in the late 1870s, when the U.S. government was attempting to take over the Nez Perces' territory. Tribe members attempted to escape over the Canadian border while defending their possessions. Failing to find sanctuary in Canada, they were forced to surrender. Their belongings were seized, and their horses were taken or slaughtered. During the Depression years, interest in the breed grew once again, and the few surviving horses were used to create the foundation of the breed. The Appaloosa Horse Club was created in 1938 and has presided over the breed's resurgence in the years since, during which the Appaloosa Horse has become the third largest horse breed registry in the world. No firm breed standard exists for body type, and there's wide variation among the breed. Frequently crossbred with American Quarter Horses, many Appaloosa horses are stocky cow-horse types, while others are more racy and primitive. The Appaloosa horse typically stands between 14.2 and 15 hands high. The average weight ranges from 950 to 1,200 pounds. Healthy, adaptable, and hardy, the breed has an average lifespan of about 30 years. Appaloosas enjoy good general health and are not prone to lameness. They don't require much in the way of special care, but a few precautions help keep this horse as healthy as possible. For example, exposed areas of light skin (particularly on muzzles) should be protected from sunburn with an equine sunblock. Their eyes tend to water, so a fly mask can help keep flies away from the area. Additionally, they're a bit more prone to equine recurrent uveitis than most other breeds. This is an infection of the eye's uveal tract, which causes puffiness, redness, and squinting, and can result in eventual damage to the retina if left untreated. Appaloosas who carry the gene responsible for certain patterns are sometimes born with congenital stationary night blindness (CSNB). Afflicted at birth, such horses lack night vision. A veterinary ophthalmologist can perform an electroretinogram (ERG) vision test to check if a horse has the condition. The modern Appaloosa is an all-around versatile horse, used for pleasure and long-distance trail riding, working cattle and rodeo events, racing, and many other Western and English riding sports. The Nez Perce used them for transport, hunting, and battle. This is a friendly, gentle horse whose loyalty makes it an especially rewarding and enjoyable companion. The base color of the Appaloosa can be red roan, blue roan, bay roan, gray, palomino, chestnut, cremello/perlino, grulla, dun, buckskin, black, brown, dark bay, or bay. Facial colors and patterns include bald, blaze, snip, stripe, and star. On the legs, you might find eel, pastern, ankle, half-pastern, coronet, stocking, half-stocking, and lightning marks. Blanket pattern: The haunches are all white, or are speckled with white or dark spots. Leopard pattern: The body is mainly white, with dark leopard spots. Snowflake: The body is dark with white flecks, especially over the haunches. Marbleized: White and dark hairs mingle to create a mottled appearance. Frost-white hairs create flecks throughout a dark coat color. Solid-colored Appaloosa horses may be "appendix registered" because they can carry the gene for a coat pattern but not exhibit that particular pattern themselves. The manes and tails of most Appaloosas are very sparse. Thinly haired areas of the body such as the muzzle are mottled, and the hooves are often striped white and dark. 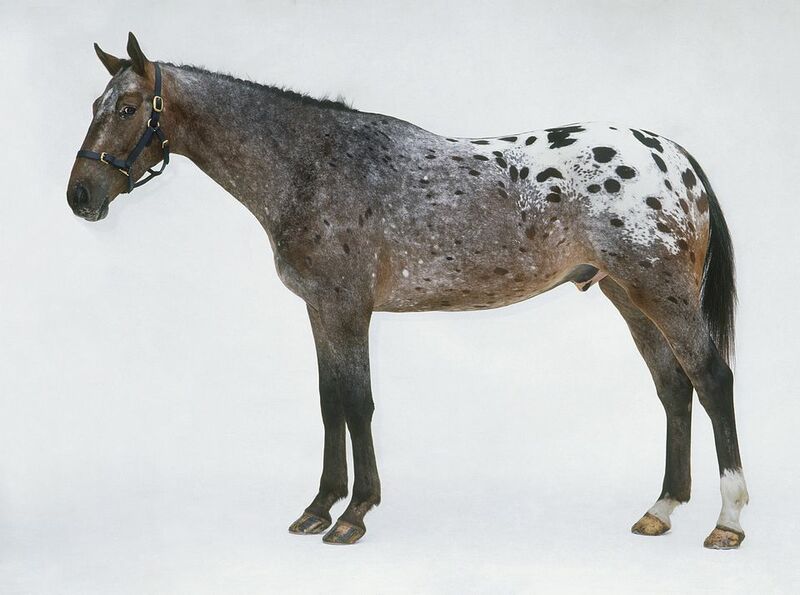 The Appaloosa is known for its eye-catching coat, of course, which is also referred to as "parti-colored." Hardiness and agility are especially valued traits, along with an exceptionally faithful nature and gentle demeanor. The striping on this horse's hooves is unusual among breeds. This runs vertically, with a distinct, alternating pattern of dark and light on each hoof. The potential combinations of base color, spotting, mane, tail, and hoof coloring and patterning are virtually limitless, giving each individual Appaloosa a distinct appearance unlike any other. The Appaloosa's sclera—the white portion of the eye that surrounds the iris—is visible, a characteristic not see in other horse breeds. One of the more notable foundation stallions was Red Eagle. He was actually part Arabian, as it was common to breed to other light horse breeds in an effort to recover the Appaloosa breed. Red Eagle is found in many Appaloosa pedigrees today. Sundance F500 was a leopard-spotted Appaloosa stallion foaled in 1933. His descendants continue to exhibit his beautiful coat pattern. Sundance's pedigree contains horses of Thoroughbred and Mustang breeding. Knobby is the antecedent of the Toby line of Appaloosas and is recognized as a foundation sire. The breeder's herd was not affected by the U.S. government's confiscation, so he was an important contributor of foundation stock for the breed. Is Appaloosa Horse Right for You? This gentle breed is a good choice for beginning equestrians and for anyone wanting a devoted companion. It's a low-maintenance horse that is just as happy in health in a barn or stall as it is in a pasture. If you'd like even more information on other kinds of horses, visit our horse breed library.